Although most modern art aficionados are familiar with legends such as Jean-Michel Basquiat and Frida Kahlo, Caribbean and Latin American art has a rich, storied history dating back almost 4000 years. 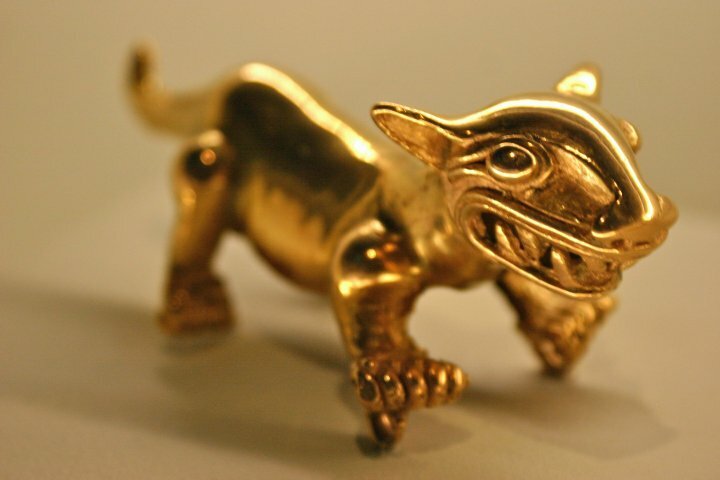 Long before Columbus set sail for the New World and “discovered” lands that had been settled for centuries, cultures such as the Aztec, Inca and Taíno were crafting masterful Latin American art sculptures, jewelry and architecture that rivaled anything their Greek and Roman counterparts created. 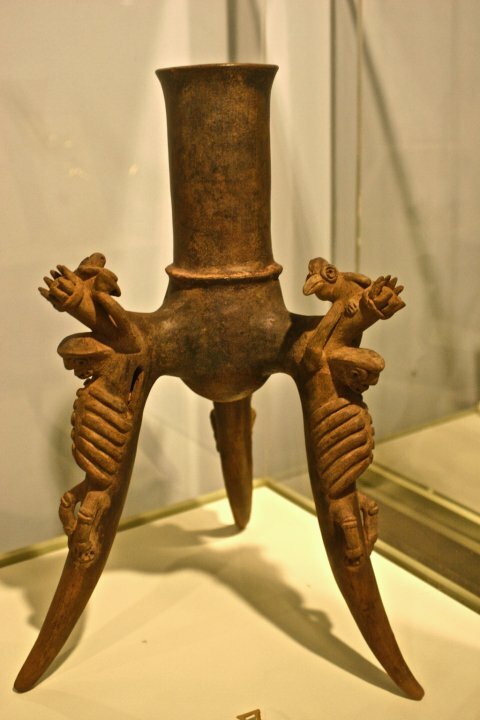 Pre-Columbian art thrived in the Caribbean, Central and South America from approximately 1800 BC to 1500 AD. Though there were a broad variety of regional styles, certain traditions recurred throughout, including angular patterns, geometric designs, three-dimensional ceramics, and extraordinary amounts of time and energy spent preparing societal leaders for their journey into the afterlife. Most pre-Columbian cultures viewed reality as multilayered, with numerous deities connected to the forces of nature. Their offerings associated with burying the dead are the source of many of the cultural artifacts found in the region’s museums today. The dominant civilization of Latin America’s pre-classic period (up to 200 AD) was the Olmecs, who launched the Mesoamerican tradition of large ceremonial centers and specialized in jade figurines and colossal sculptured heads that still dot the landscape today. During the Classic period (200-900 AD), the Maya became the most prominent culture, with art focusing primarily on agriculture and fertility that included glyphs, hieroglyphic writing, sculpture and murals, as well as architectural achievements such as the pyramid at Chichén Itzá. By the 12th century, cultures such as the Toltecs (known for free-standing columns), Mixtecs (murals characterized by geometric designs) and Aztecs (stone sculpture and elaborately decorated skulls) had risen to prominence. Down in South America, the Inca Empire succeeded Andean civilizations such as the Chavín, Moche and Chimú, gradually developing into the largest and wealthiest empire in the world at the time of the Spanish conquest. 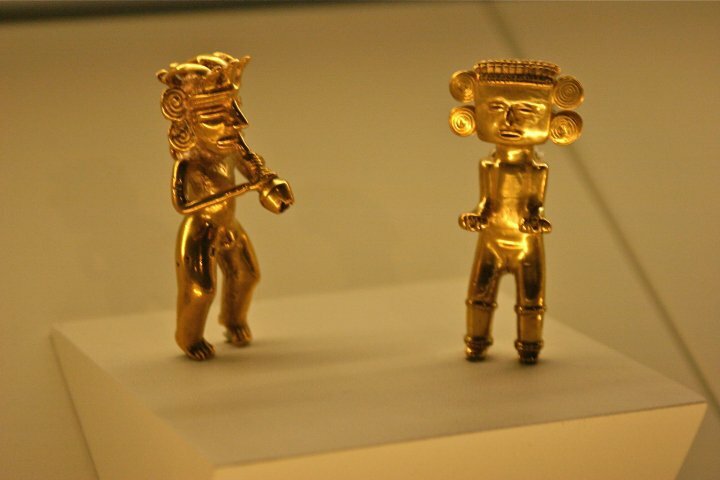 Though best known for the stunning architecture of world heritage sites such as Peru’s Machu Piccu, the Inca also specialized in intricately designed textiles, ceramics, stonework and especially sculptures made from gold (which was equated with their sun god, Inti). Over in the Caribbean, the islands of the Greater Antilles were dotted with communities of Taíno Indians, whose expressive forms of sculpture, weaving, pottery and jewelry continue to influence local culture today. With the arrival of the Spaniards, the art of Latin America and the Caribbean began to evolve, gradually incorporating European influences into indigenous traditions. The Augustinian, Dominican and Franciscan friars who brought the teachings of Christianity inspired the development of Arte Indocristiano, a form equally influenced by Spanish, Portuguese and French Baroque traditions and the trends of the Italian masters. This cultural exchange between native Indian and European art aesthetics led to dazzling creations that crossed ethnic, political and religious lines. There were paintings of the baby Jesus wearing a gold-stamped robe over Andean sandals; portraits of Inca kings clad in plug earrings, woven armor and a domed helmet that could pass for European; and figurines of the Virgin Mary wearing a cloth dress of Latin American tradition, but with decorative embellishments clearly of Spanish origin. Though history books long held that European culture was vastly superior, time has shown that the New World’s native cultures were equally rich and sophisticated. As more and more countries became independent of their Colonial conquerors, more and more artists began to embrace their native cultures, creating art filled with tension between European modes of expression and indigenous themes. As a result, the art of Latin America and the Caribbean exploded in popularity during the 20th century, with artists such as Diego Rivera, Wifredo Lam and Roberto Matta becoming some of the world’s most celebrated talents. These days, most countries in the Caribbean and Latin America seem to celebrate all eras of their cultural history with equal appreciation. 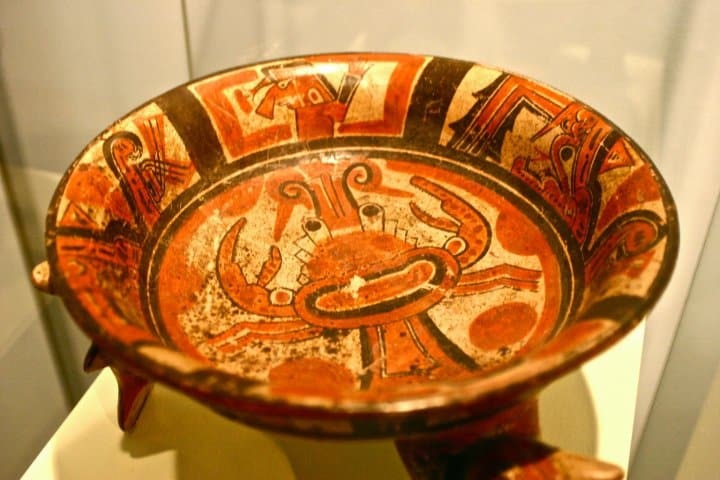 In Panama, you can check out excellent collections of pre-Columbian art at the Instituto Panameño de Arte, masterworks from the colonial era at the Religious Colonial Art Museum, and contemporary works by native artists such as painters Carlos Francisco Changmarín and Guillermo Trukillo at the Museo de Arte Contemporaneo. Over in Guatemala, Museo Ixchel del Traje Indigena features clothing, textiles, painting and sculptures by the country’s Mayan people, while the ultra-modern Museo Popol Vuh is a natural history museum featuring funerary ceramics and other artifacts spanning the period from 2000 BC through colonial times. In Cartagena, Colombia’s historic walled district you can walk from the Museo de Arte Moderno (which features the fantastical works of modern talents such as Dario Morales) to El Museo del Oro Zenú (which is filled with pre-Columbian pottery, musical instruments, textiles and the intricately filigreed gold jewelry for which the Zenú were known), strolling by an outdoor installation of sculptor Fernando Botero’s Mujer Reclinada (“Reclining Woman”) along the way. Lima, Peru’s Larco Museum is world-renowned for its stunning collection of over 45,000 pre-Columbian artifacts, with its sister museum– Museo de Arte Precolumbino– offering a smaller but still impressive collection in the San Blas region of Cusco. For modern art, check out Lima’s Galeria de Arte Moll, which features works by contemporary artists such as Angel Chávez and Fernando de Szyszlo in its permanent collection. The Latin American art influence extends out to Caribbean countries such as the Dominican Republic and Puerto Rico, which are home to sociopolitically charged woodblock artist Belkis Ramirez and controversial painter Pablo Marcano Garcia, respectively. To view the best art these countries have to offer, visit the DR’s Altos de Chavon Cultural Center and the Museum of Taíno Art (in Puerto Plata), and Puerto Rico’s Ponce Museum of Art, which features over 3,000 pieces spanning the 14th to 20th centuries. In other areas of the Caribbean, such as Jamaica and Trinidad & Tobago, the West African traditions passed down through generations of descendants of former slaves are more prevalent in the artwork. Kingston’s National Gallery of Jamaica showcases important works by local artists such as Mallica “Kapo” Reynolds, Cecil Baugh and Edna Manley, while the 10,000-item collection at Trinidad’s National Museum & Art Gallery includes pieces by celebrated painter Michel-Jean Cazabon. Other islands, such as the Bahamas (Great Britain), Grand Cayman (Great Britain), St. Maarten/St. Martin (Netherlands/France) and the U.S. Virgin Islands, maintain closer cultural ties to their colonizing countries, as the Bahamas is the only one to have gained independence. The National Art Gallery of the Bahamas, National Gallery of the Cayman Islands, St. Maarten’s Gingerbread Gallerie and St. Thomas’ Mango Tango Art Gallery feature some of the best works these countries have to offer. Truth is, no matter where your travels may take you in the Caribbean, Central or South America, you’ll find that art and creativity continue to thrive vibrantly, as native, European and African influences blend together to break down the cultural walls that divide us as human beings.